The image of going out west for a guided Elk hunting trip can sound very appealing until you consider your chances for success. 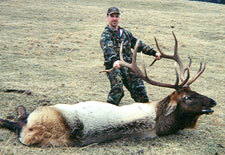 Both the Roosevelt and Rocky Mountain subspecies of Elk are examples of big game animals that are abundant yet hunted hard and managed primarily for quantity. The success ratio for taking a Trophy Bull is about 4% and hunters typically must allow for a minimum of 7 to 10 days of hunting, just to be part of that small percentage. Even if one hunts with a guide with an excellent reputation, there is no guarantee that they will take a bull, and the cost will undoubtedly be very high. Several years ago Colorado up scaled their harvest system. Although this is a step in the right direction, if further decreases the opportunity to take a reasonable Elk. The license fee is presently $501. In Montana, the demand for licenses was so great that they sold all in one day. Presently, licenses cost between $643-$1195. In New Mexico, the present cost of a license is between $550-$775. In Idaho, every license sold out rapidly at a cost of $372.50. Have you even considered the issue of CWD? Chronic Waste Disease is a fatal neurological disease found in Deer, Elk, and Moose. It belongs to a family of diseases known as transmissible spongiform encephalopathies or prion diseases. The disease attacks the brains of infected Deer, Elk, and Moose, causing the animal to become emaciated, display abnormal behavior and in coordination, and eventually die. ***High Adventure Ranch is CWD FREE.